Almost 10 years to the day after Mel Gibson’s The Passion Of The Christ shook the commentariat to its core, another feature film arrives in theaters to repave the road to Calvary. Don’t mark that anniversary calendar just yet: Son Of God is actually a re-edit of last year’s History Channel series The Bible, which became controversial less for the fact that it was airing on the History Channel than for its depiction of Satan, played by an actor some observers felt bore a resemblance to President Obama. Survivor and The Apprentice producer Mark Burnett and his wife, Roma Downey, admit they’ve “cast Satan out” of this cut. Son Of God’s origins in longer material are still apparent from its overstuffed opening montage, which situates Jesus’ story in an Old Testament lineage and plays like a trailer for a series of equally ham-fisted movies on Adam and Eve, Noah, and Abraham. While Martin Scorsese and Pier Paolo Pasolini envisioned screen Christs who convincingly walked among mortals—talking to ordinary people, wrestling with ideas, persuading followers and themselves—Son Of God emphasizes the awe factor. No doubt squandering a sizable portion of its budget, the film goes wild with helicopter shots of Jesus and his followers traveling through the hills. Who knew Christ was lord of the rings? Looking a bit like a young Brad Pitt, Portuguese actor Diogo Morgado delivers his lines so earnestly that his words come across less as teachings than pitches: “Peter, just give me an hour, and I will give you a whole new life.” Unlike Gibson’s film, with its relentless and gory focus on Christ’s last days, Son Of God finds time for lessons along with its bloodletting. (The latter is hardly mitigated, though, despite the PG-13 rating; when the whip man readies himself, there’s a shot of him kicking up sand like a batter at home plate.) Accompanied by a score that sounds recycled from The Fountain, the most famous scenes are trotted out: “I’ll give my stone to the first man who tells me that he has never sinned”; the loaves and fishes; the resurrection of Lazarus; the last supper. 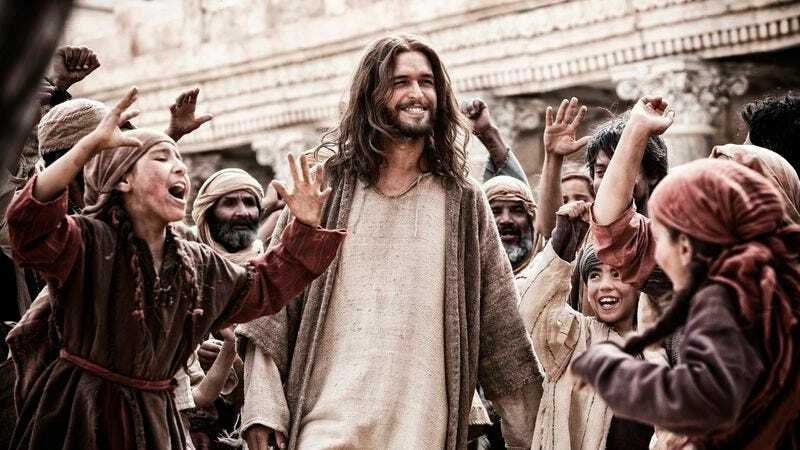 It’s unlikely Paul Verhoeven will ever get to make his historical Christ movie, but to the extent that Son Of God has a measure of dramatic impact, it’s how it illustrates the radicalism of Jesus’ message and the threat it posed to the establishment. At any rate, the core ideas are more compelling than the bad effects shots of Jerusalem, the cheesy CG water-walking, or whatever exchanges require the actors to emit something other than a declarative shout. Then there’s the issue of whom the movie paints as responsible for Christ’s death; concerns were raised at the time of the series about perpetuation of negative images. The filmmakers will no doubt cherry-pick lines from the scriptures, but Son Of God really does go out of its way to pin Jesus’ execution on the Jewish people. Certainly, there’s no gospel that suggests a juxtaposition of Christ’s final moments and a scene of a talis-wearing Caiaphas in prayer. The caricatured Jewish leaders, shown as politically pliable, manipulate a dignified, British-accented Pilate (Greg Hicks), who gets his own moment of what is surely unintentional Catskills humor. (“Sir, the high priest Caiaphas and his soldiers are here to see you.” “Uch.”) On the other hand, it’s hard to think of another movie in which Jesus’ followers are so clearly shown as Jews themselves. There’s a quietly powerful post-Crucifixion scene in which the disciples say Kaddish for their fallen leader. Christ’s burial is followed by what may be the least necessary title card in cinema history: “Three days later.” Surely the resurrection comes as no consolation to the movie’s Pilate, who scoffs, “He’ll be forgotten in a week.” Not so. For symmetry’s sake, Son Of God should have ended with a montage tracing the line from Constantine to the Sistine Chapel to Pat Robertson to the movie itself. Who'd have prophesized a mass-market Christ picture in which CeeLo Green sings over the closing credits?